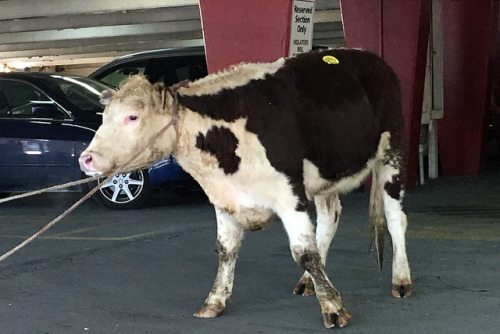 Last week, yet another bull escaped from a New York City live market — the third in less than 13 months. And people are outraged. 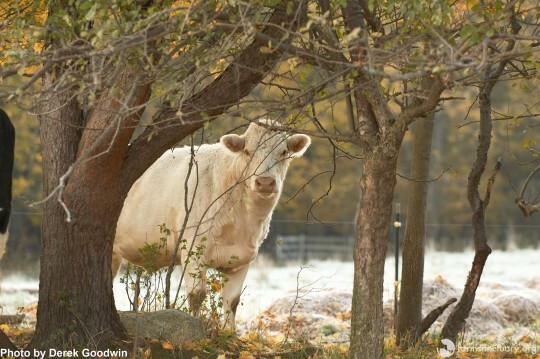 And this bull had a place lined up to go — a chance not only to survive, but to actually live out his life with other cattle and a new family. 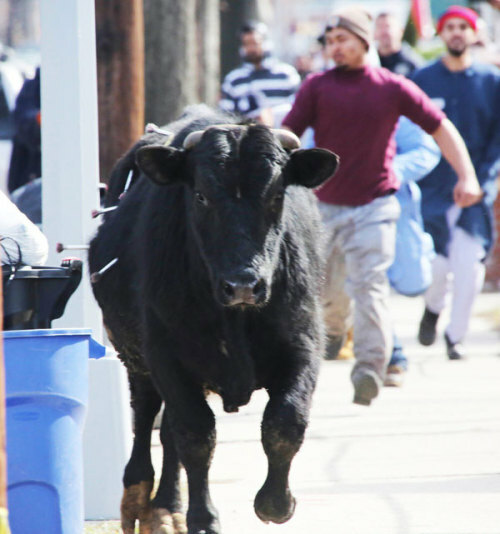 Upon learning of this bull in need, Mike Stura of New Jersey-based Skylands Animal Sanctuary and Rescue immediately set out for the city, but sadly, this sweet boy — one of millions killed every year for food — was already gone. From left to right: Queenie (rescued August 2000), Maxine (rescued September 2007), Freddie of Skylands Animal Sanctuary and Rescue (rescued January 2016), and Frank (rescued April 2016). Maxine thankfully was also roped after only light sedation and again she was run into a yard and had the ability to calm down. She was also much smaller. Photo by Ellis Kaplan of the recent escapee being chased – already darted too many times. 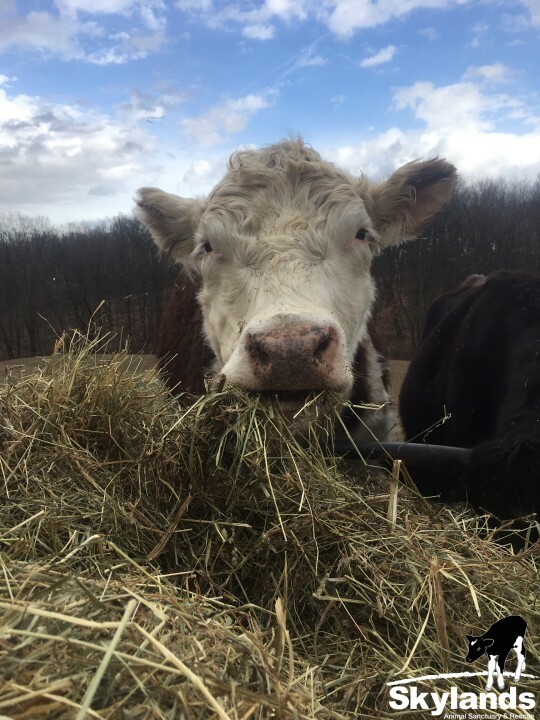 Freddie enjoying life as a free man at Skylands — loving his people and his hay. 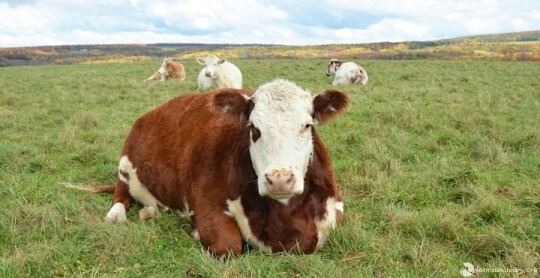 For the sake of statistics, more than 18,000 cattle are slaughtered in the U.S. each day. So why is this bull so special? Because he got loose — he was free, and people were rooting for him. People saw him. There are likely others in the same facility — but we saw him, and watched him try. But he still died, and now, for many people shocked and upset by the loss, there seems to be the need to blame someone — in many cases, the police — but is that really fair? The most handsome face of the now sweetest boy, Frank. 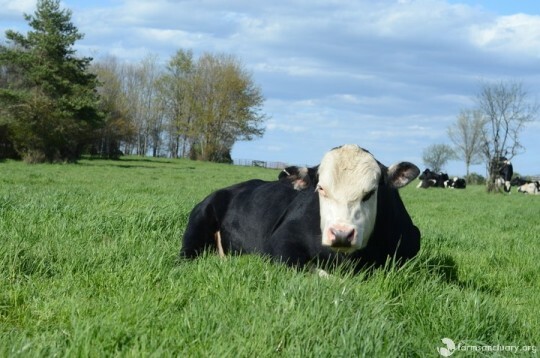 Although he attempted to hurt people during his escape, he has been a perfect gentleman since his arrival at Farm Sanctuary. killed someone else — because he was running for his life. The police are not hired to protect and serve cattle — many will eat a burger after work. They are hired to protect people. 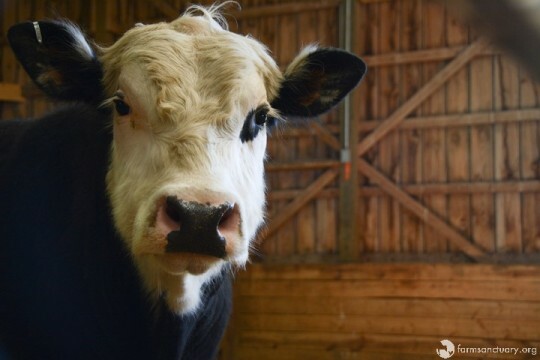 Queenie is one of our smallest cows and was an adult when she arrived — although she was the size of a calf. Here, she demonstrates that even an 800-pound girl like herself can cause damage — serious damage. So are the police officers who tranquilized him alone to blame? 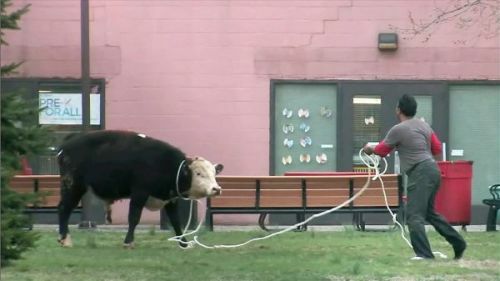 Should all 32,000 potential police officers in New York City be trained to properly tranquilize bulls? Again — they are hired to protect people. One of my favorite things about those who have escaped slaughter is that they are drawn to each other. 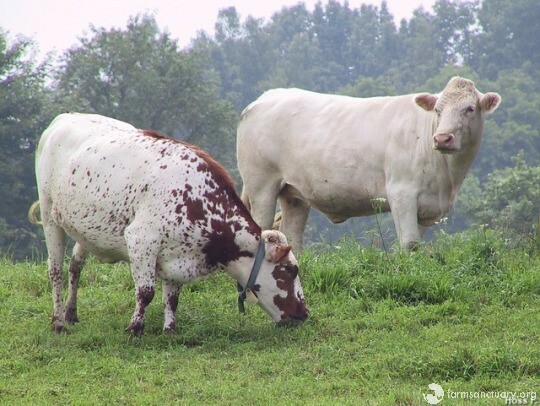 Here, Queenie and Cinci Freedom spend time together enjoying sanctuary life. 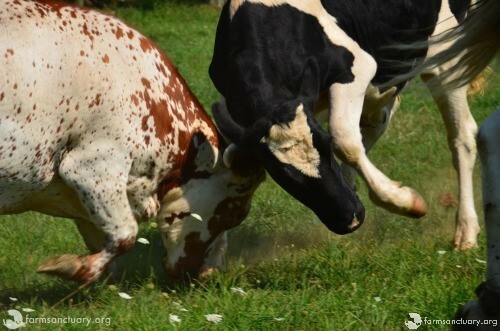 Cattle are prey animals, and they have a fight-or-flight response. Bulls and cows brought to the live markets are originally from farms, where they spend their time with their bovine family and herd outside grazing. A very few of them are shipped into New York live markets; most are sold at auctions and slaughtered elsewhere. 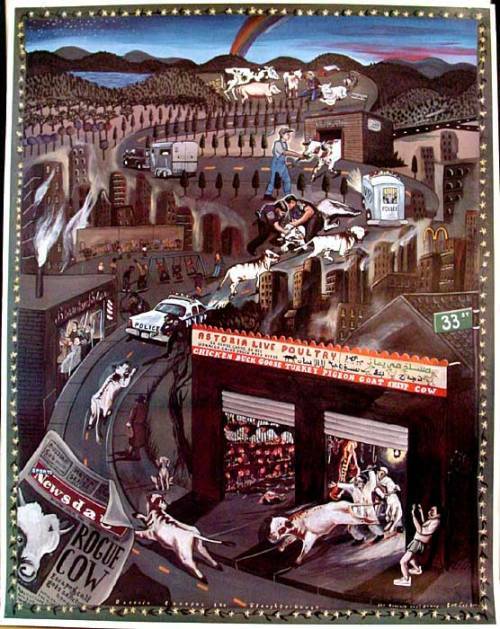 This bull was likely not the only bull, cow, sheep, goat, chicken, duck, etc., who died that day in a Queens slaughterhouse. And he was scared. 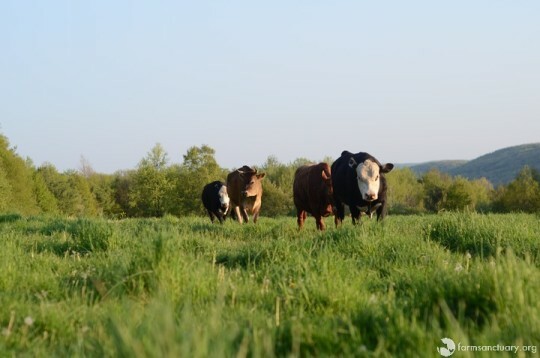 Even when we have to sedate our friendliest, calmest steers at sanctuary, we walk away after the sedative drugs are given — we don’t chase them or even hang out around them, so that they will feel safe and go to sleep. Maxine disguising herself as a powdered doughnut. So let’s look at other cases in which animals lost their lives in recent years. Many animal lovers placed the blame on those whose decisions, in the end, led to the animals losing their lives. But are they really to blame? 1. Many blamed the zookeepers and the mother of the child who fell into the exhibit in the 2016 case that ended tragically with the death of the magnificent gorilla Harambe at the Cincinnati Zoo. But was the blame only theirs? Again, I don’t think so. 2. I vividly remember the 2011 case of Ohio resident Terry Thompson, who threw open the cages of his private exotic animal collection before committing suicide. Police, having no method to tranquilize these animals, ended up killing 48 of them. There was an outcry against the officers, who were accused of being trigger-happy — but was that really the cause of this tragedy? 3. In 2010, a very pregnant Holstein cow in a birthing tent, where visitors to the California State Fair can witness the miracle of birth, escaped. Because she was unable to be knocked down with tranquilizers, she was shot and killed. 4. 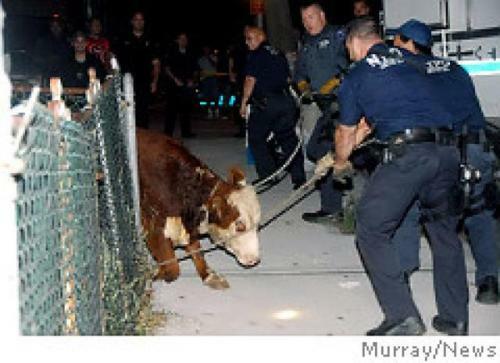 Just last year, another fairground-escapee bovine ran over a police officer and a teenager, and was shot and killed. 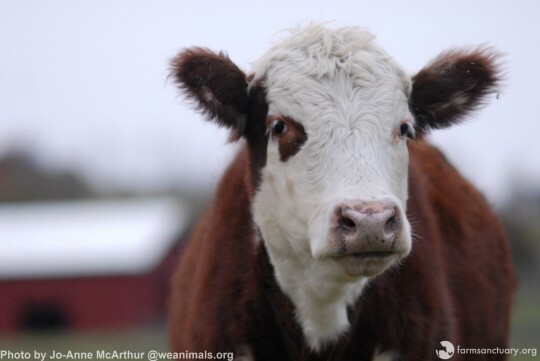 The Queen — our first live-market escapee, Queenie, is still with us more than 16 years after her dash for freedom. 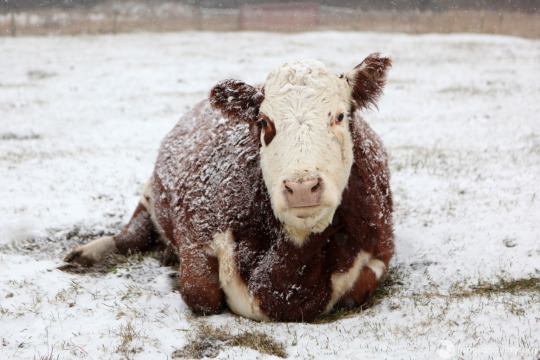 Multiple times each year, cattle are shot down to avoid injury to people in areas where they escape. 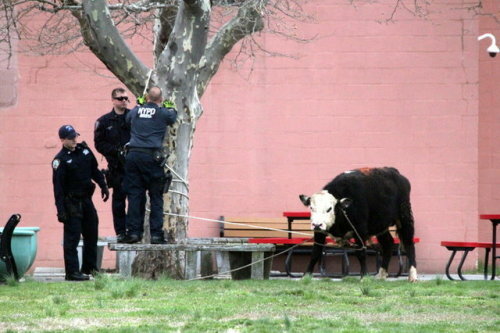 And just a few weeks ago, a steer escaped, but was recaptured. This happens, too, and the ending is far worse for the animal: being returned to the slaughterhouse. Cinci Freedom was always aware when humans were near, and like so many escapees, did not ever fully become comfortable with humans. So when thinking about this most recent case, as in the endless other cases, perhaps stepping back and looking at the big picture is the only way to fairly assess why these beings died. Frank’s first week in the herd. Big girl Maxine with her people. The one in the right rear is Queenie. Private citizens should not be allowed to obtain exotic cats and dangerous wild animals. A small Ohio town (or any town) is not equipped to rescue that many loose and potentially deadly animals in one night. Frank and his new family — and new best friends. From front to back: Frank, Nik, Dennis, and Chandini. And animals should not be put on display — especially a vulnerable, pregnant mother ready to give birth. Of course she ran — she was afraid. The beautiful Maxine! 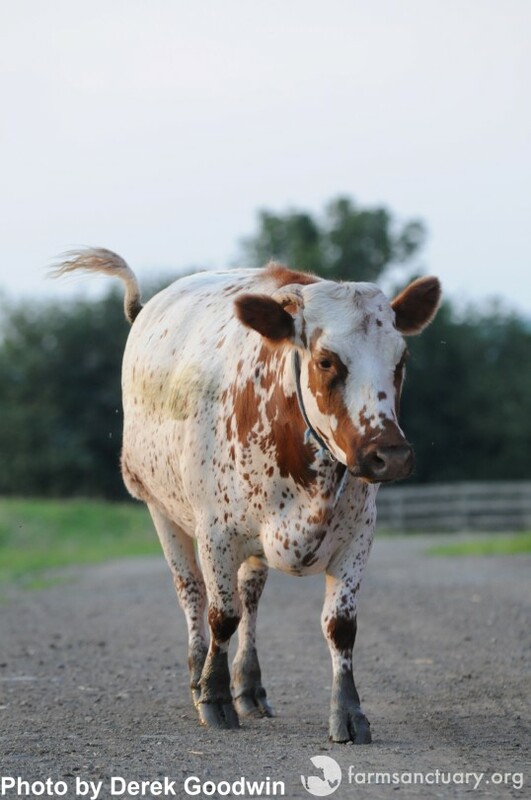 Although she has never become close to people, she loves her cattle family. city. We mourn the loss of this and all beings whose lives are cut short, who go unnoticed and who never get the chance to really live. R.I.P., sweet boy.